Technically, German SEO is relatively straightforward. Linguistically, however, it can be a challenge. Here’s why – and how to get it right. Germany is a popular market for brands looking to expand internationally. It’s the fourth-richest country in the world, with the largest population and economy in Europe. German online consumers embrace technology in big numbers. In 2018, internet penetration increased by 5%, meaning five million more people now have access to the web. And they spend over four and a half hours a day online. And this trend will continue to grow. While high-speed internet is largely considered a luxury in Germany, it will be a legal right by 2025. When it comes to reaching Germany’s growing online audience, Google accounts for 95% of the German search market. So US marketers don’t need to adapt to a new search engine to build brand visibility and engage customers. Technically, that makes German SEO pretty intuitive. But German search behavior and keyword selection can be tricky. Here’s why – and what to do about it. Germany has one of the highest English proficiency levels in the world – and it keeps improving. With so many German consumers able to understand English, localizing online content into German may seem unnecessary. But 59% of international consumers never or rarely buy from English-only websites. And Germany is no exception – especially given the recent drive to champion the German language. Localizing your site gives customers a better user experience, in their own language. And the more developed the economy and the higher the competition in-market, the more important in-language content becomes in driving engagement. When determining what content to translate on your site, here are some things to consider. 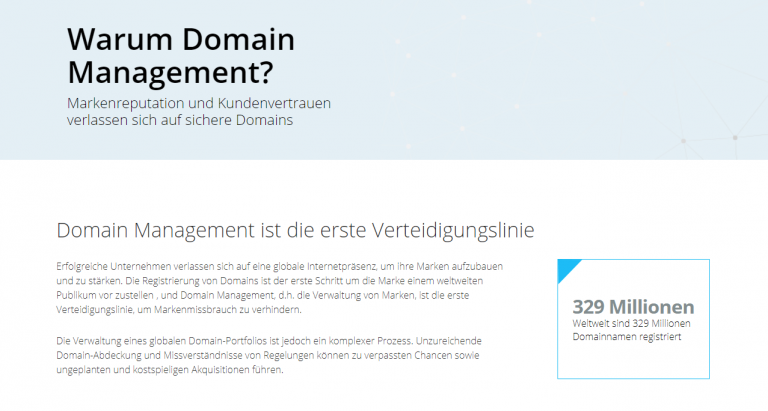 Here, the English term “Domain management” has been used because an equivalent doesn’t exist in German. This is often the case with technical terms. And it’s one of the reasons why international keyword research is so important. Unlike keyword translation, it can tell you whether targeting an English or German term will be more effective for your brand. It can also help you get a leg up on the competition and drive brand awareness and engagement. Keyword research can also inform your content strategy, helping to identify whether this is a missed opportunity. Many companies deprioritize localizing blog content, for example, without first doing their research to establish whether their content may be in demand. If you’re still on the fence about localizing your online content into German, keep in mind that doing so could broaden your reach across Central Europe. German is an official language in six countries: Germany, Austria, Switzerland, Belgium, Luxembourg, and Liechtenstein. The German variant, Hochdeutsch, is spoken in Germany and widely understood in other German-speaking countries. If translation budget is limited, this is a solid starting point in reaching German consumers. However, to specifically target these markets, keep in mind that these countries use their own German variants. When it comes to search volume, this can impact your SEO strategy. For example, the German term “Fahrkarte” means “ticket” and receives 5,400 searches a month in Germany. But in Switzerland, only 170 monthly searches use this term. Instead, the Swiss prefer the term “Billett,” which yields 3,600 searches per month. In this case, the most effective keyword strategy would be to target “Fahrkarte” in Germany and “Billett” in Switzerland. Here again, international keyword research is key to help you identify the most relevant German content strategy for your brand. German is an incredibly rich language. Take the word “shop” as an example. Depending on the context, it can be translated as “Geschäft,” “Laden,” “Kaufhaus,” or “Werkstatt.” All have a strong search volume. How can you tell which one is right for your content? Context is key. In-market digital experts know that while “Kaufhaus” has the lowest search volume, it’s the most relevant term to target for department stores. And although “Werkstatt” is the most popular keyword, it means “workshop,” and isn’t the right choice for targeting online shoppers. In-country expertise and data-driven insight will help you develop your German keyword content strategy for local relevance. Working with in-market experts can also help you keep up to date with changes in German SEO. For example, in German you can combine nouns to form compound nouns. This used to have big implications for German SEO strategy because of Google’s limited support for compound nouns. For the English search term “clothes shop,” Google shows results for “clothes,” “shop,” and “clothes shop.” Searching in German using the translation “Bekleidungsgeschäft,” Google would only show results for the exact term. Because this limited results for German users, search behavior shifted toward using split phrases – in this instance, searching for “Bekleidungs geschäft.” While grammatically incorrect, German users knew they would get better search results this way. This left marketers with a dilemma when translating and optimizing their content for German search. Should on-page SEO prioritize grammatical accuracy and UX or the most popular keywords? Fortunately, Google’s algorithm has become better at handling German compound nouns. Now whether you search “Bekleidungsgeschäft” or “Bekleidungs geschäft,” you’ll get almost identical results. But it’s a good example of how in-country expertise informs content strategy, and a dilemma can emerge between linguistic accuracy and SEO. The same consideration can come up when it comes to metadata and character length restrictions. In-market SEO experts will select the right terms for limited space, and integrate them naturally with your translated content. For page copy, title tags, and meta descriptions, there’s no issue here. But it’s trickier for URLs. Google best practice is to do what’s best for your audience, which in most cases means including the umlaut. Umlauts aren’t included in the ASCII character set, so to use them you’ll need UTF-8 encoding. It will result in something like this: %C3%84 (for Ä). More and more brands are adopting this approach. However, before rolling it out across your site, double-check it’s compatible with any third-party applications you use. From a technical perspective, the simple solution is to remove the umlaut and add an “e” after the vowel. This turns “Lösung” into “Loesung.” Google recognizes this as the same word, so it’ll show up in search results for “Lösung.” Be aware that page rankings based on this approach are similar to option 1 above but not identical. Assuming the rest of your German SEO is up to scratch, it shouldn’t be a problem. Linguistically, German SEO can be complicated. Which German variant should you use? Should you leave terms in English? How do you choose the right keywords? The solution to all these questions is to partner with in-market digital experts who can guide you through the process and improve your site’s ranking and performance.